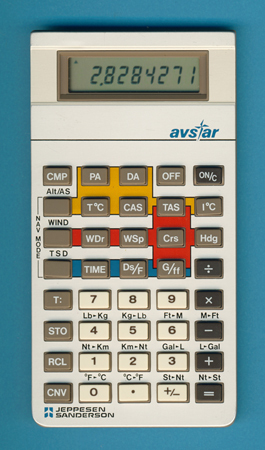 This Flight computer developed by the Aviation specialist Jeppesen Sanderson and calculator manufacturer Texas Instruments is based on the avstar slimline model introduced in the year 1980. We assume that the original avstar suffered from the same keyboard problems known from other slimline models like the TI-35. Four years later a more reliable keyboard was available from the TI-35-II and as a consequence we got this wonderful avstar. Dismantling an avstar Flight computer manufactured in July 1989 by Compal Electronics in Taiwan reveals an unusual construction with a well known TP0328 single-chip calculator circuit. A more sophisticated Flight computer sold as prostar by Jeppesen Sanderson used the slanted housing known from the TI-55-II. Later Flight computers sold by Jeppesen Sanderson like the Techstar based on a non-TI design. Don't miss the rare APOTHECALC computer using similiar technolgy for a different application. The colorful keyboard of this Flight computer makes it easy to understand the functions. PA - stores a value in the pressure altidude register. DA - computes the density altitude. T°C - stores a value in the true temperature register. I°C - stores a value in the indicated temperature register. WDr - stores a value in the wind direction register. WSp - stores a value in the wind speed register. TAS - stores a value in the true airspeed register. Could use a calculated value from Altidude/Airspeed mode, too. Crs - stores a value in the course register. Hdg - stores a value in the heading register. TIME - stores a value in the time register. Ds/F - stores a value in the distance or fuel quantity register. G/ff - stores a value in the groundspeed or fuel per hour register. Your groundspeed is 120 knots, the distance 140 nautical miles. How long is the time enroute ?